Arc welding is one of the key processes in industrial manufacturing, with welders using two types of processes - gas metal arc welding (GMAW) and gas tungsten arc welding (GTAW). This new book provides a survey-oriented account of the modeling, sensing, and automatic control of the GMAW process. Researchers are presented with the most recent information in the areas of modeling, sensing and automatic control of the GMAW process, collecting a number of original research results on the topic from the authors and colleagues. 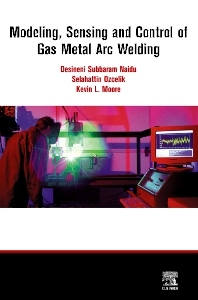 Providing an overview of a variety of topics, this book looks at the classification of various welding processes; the modeling aspects of GMAW; physics of welding; metal transfer characteristics; weld pool geometry; process voltages and variables; power supplies; sensing (sensors for arc length, weld penetration control, weld pool geometry, using optical and intelligent sensors); control techniques of PI, PID, multivariable control, adaptive control, and intelligent control. Finally, the book illustrates a case study presented by the authors and their students at Idaho State University, in collaboration with researchers at the Idaho National Engineering and Environment Laboratory. Mechanical and industrial engineers and researchers, working or studying in the area of gas metal arc welding. GMAW:Modeling. Gas metal arc welding, Physics of welding, Melting rate, Metal transfer charecteristics, Weld pool, Process voltages, Heat and mass transfer, Process variables, INEEL/ISU Model, Empirical and statistical models, Modeling by system identification and estimation, Intelligent modeling, Other issues on modeling, Power supplies. GMAW:Sensing, Classifications of sensors, Conventional method, Computer-based measurements, Welding parameters monitoring, Sensors for line following/seam tracking, Arc length sensors, Sensors for weld penetration control, Sensors for weld pool geometry, Optical sensors, Sensors for quality control, Intelligent sensing, Other issues in sensing, Classification of references by section. GMAW:Case Study. Introduction, Empirical modeling of a GMAW process, SISO current control using PI controller, Multi-loop control of the GMAW process, Adaptive control of GMAW process, Control strategy, Summary, Classification of references by section.Conclusions: Control technology and automation in welding, Main issues and outlook, Classification of references by section.